A heart for Lastofa Forte – now also for arm and hand segments. Designs for every requirement? Naturally. With Lastofa Forte. It simply feels good. Lastofa Forte. Now also for arm and hand segments. 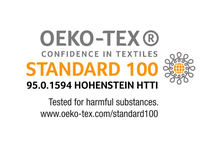 Ofa Bamberg stands for innovation and quality. Since it was founded in 1928, Ofa Bamberg has had a clear demand: Maximum comfort and attractive looks at best effect. 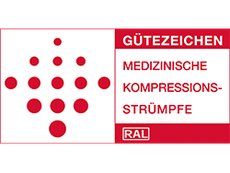 In addition to a large selection of modern compression stockings, Ofa Bamberg offers a comprehensive range of orthopaedic supports and ortheses. Preventive health products, including support and travel stockings as well as pleasant heat cushions, complete the range. As a company Ofa Bamberg is also very much in demand outside Germany. 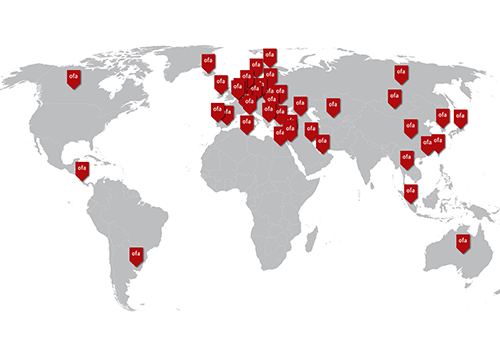 We export our products to more than 40 countries world-wide, starting from A like Aruba to U like Ukraine. Please find our international partners here. You don´t yet know our stockings or don´t know exactly what our stocking range holds in store for you? The product-finder helps you to select your stocking according to your own criteria and requirements. If you click on a product feature or a model, all possible combinations are shown. Just click your way through. Spider veins, thrombosis or the so-called ‚open leg‘ – discover all you need to know about venous disease, types of therapy and, of course, find advice on what can be done to prevent the problem from occurring in the first place. Also, we'd like to inform you about the special treatment on lymph- or lipoedema. Here, you will find information on causes, symptoms and therapy methods. You will also receive useful advice for an easy everyday and active life. What is the difference between lip- and lymphedema?